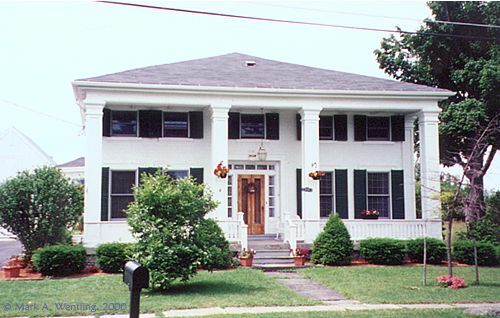 At 205 West Washington Street stands one of the finest Greek Revival houses in Sackets Harbor. The lot on which it stands was purchased for $300 on 29 November 1836 from Thomas Ludlow Ogden, trustee, of New York City, by Francis Mallaby, captain of the Ontariothe second steamship on the Great Lakes. The lot was 201 feet deep, with 100 feet frontage on the south side of West Washington Street between Bayard and Ambrose Streets. On 22 April 1844, Francis and Eliza Mallaby deeded the lot to Dyer N. Burnham, prominent lawyer and editor of the Sackets Harbor Journal. Burnham is probably the one who erected the house, since it was constructed circa 1844. On 28 March 1853, Dyer and Sylvia Burnham sold the lot and house for $2,475 to William T. Searles of Ellisburg. Searles died on 12 May 1864, and the property was subsequently sold by the estate to Capt. Ralph Godfrey and his wife Jane Stoodley on 12 September 1866. Ralph Godfrey, born 6 November 1838 in Williamstown, Oswego Co., New york, son of William J. Godfrey and Jane E. Potts, was a sailor on the Great Lakes, captaining several vessels. He, along with his wife's first cousin Manuel Jeffrey, were among the four workmen injured during the dismantling of the War of 1812-era ship-of-the-line New Orleans at Sackets Harbor in February 1884. The new owners conveyed a half-interest in the estate to his mother, Jane Eliza Godfrey on 8 April 1871. Eventually the entire estate became vested in Jane Stoodley Godfrey who died 13 August 1901, willing the house and its furnishings to her daughter Annie Godfrey, (at right, 1890), widow of Prof. John Brunson who died on Long Island in 1926. Ralph Godfrey remained after his wife's death to live in the home with his daughter. He retired from sailing in 1908 and assumed the position of janitor at the Sackets Harbor Union School, a position he filled until 1928 when the present High School was built. He died on 5 November 1934one day shy of his 96th birthday. Annie Brunson lived in the house for many years afterwards, sometimes leasing rooms out as apartments. Today the 21-room home is under the care of new owners who have beautifully restored the exterior of the home. Many features distinguish the house from its contemporaries, including its flush-board siding on all four walls, its Atticurge door and window surrounds, and its great portico of square panelled Doric columns. The recent sensitive restoration of the house included a paint scheme of white walls and dark green shutters (almost universal in the Greek Revival period) and a new porch railing with the "lyre and acorn" motif popular around the turn of the 20th-century. Brennan, Robert E. and Jeannie I. Images of America: Sackets Harbor. Charleston: Arcadia, 2000. Harbor Walk: A Guide to the History and Architecture of Sackets Harbor. Prepared by Michael D. Sullivan for the Village of Sackets Harbor and Sackets Harbor Historical Society. Permission for reproduction granted by Sackets Harbor Historical Society. Lane, David. "Old Houses of the North Country, No. 294." Watertown: Watertown Daily Times. "R.P. Godfrey, 95, Janitor, Expires" Watertown: Watertown Daily Times, 5 Nov. 1934.